When the Navy-Marine team first landed in DaNang in March 1965 at Red Beach, there were U-boat sailors in the mix with the crews of the LCUs from Amphibious Task Force 76 who moved the Marines ashore. No, the U-Boat sailors of Vietnam are not some out-of-time holdovers from the German Kriegsmarine and they are definitely not submariners which is the question I usually get whenever I mention that I was once a U-boat sailor. As the Navy took charge of logistics for I-Corps, the Naval Support Activity DaNang was established in October 1965 and given the lack of road and rail transportation networks, the Navy rapidly brought on extensive lighterage operations to supply the troops using LCUs, YFUs, LCMs and various barges. Those U-boat sailors in Nam were the hard working, hard fighting and pre-politically correct men who crewed all of those logistic workhorse crafts that hauled ammo and war materiel around-the-clock on the rivers and along the coast throughout I-Corps in spite of weather or enemy threat. That environment could be tough at times with the Northeast Monsoons coming off the South China Sea with some pretty harsh blows to include the occasional typhoon and of course there was also the constant threat of enemy mines or a well placed North Vietnamese rocket or mortar striking a boat loaded with two-to-three hundred tons of ammo to add some stress to a guy’s life. The focus of this article will be about just one of those boats, the YFU-79, a “Skilak”, and one sailor’s view. As the fighting intensified and the Allied troop strength continued to grow in the mid-60’s, the Navy found that they needed to expand their lighterage capacity. Normally, the Navy would have gone through a rather lengthy procurement process to establish requirements for a new class of U-boats since much of the existing fleet of U-boats were originally built to support the WW-II landings. Since the Naval Command needed new boats to be available quickly, it was decided to pursue a new acquisition strategy of buying “Commercial Off-the-Shelf” (COTS) boats to meet the immediate war requirement. The result of this early COTS procurement, was a contract with the Pacific Coast Engineering Co. of California. They had a craft already designed and tested in the waters of Alaska where some of the earlier models had already proven themselves to be workhorses supporting construction of the Alaskan oil pipeline. These craft were known as “Skilaks”. Under this contract the Navy purchased eleven craft under what was known as the YFU-71 Class with the first one being launched in July ‘67 and the last one a year later in July ’68. Several of the boats arrived in-country in time to support the US and South Vietnamese TET ’68 counteroffensive that at that time defeated the North Vietnamese and Viet Cong forces. Now in the case of the YFU-79, it was launched in May ’68 and arrived in Nam later that summer. The YFU-79 was typical of all of the Skilaks in terms of configuration. We normally carried a crew of eleven which included our craft master Chief Mason of Colorado who was a Bosun and a chief engineer that was a 1st Class Engineman from South Carolina whose name now escapes me. We also had a 1st Class Cook who also hailed from South Carolina. Since these new boats had been bought via “COTS”, they did have a rather nice galley as compared to the older boats and our “Stewburner” was a favorite member of the crew. The boats also had three to four other rated crew. This normally included a Gunners Mate who on our boat was Bill Suttle of North Carolina (we carried 3-50 cals, an M-79, a couple of LAWs, individual M-16s, and various types of grenades), a Bosun Mate who was Peter Norcross from Maine, and either a Quartermaster who on our boat was Rich Geiser of Michigan or a Radioman which was later me, and another Engineman who was Gene May of Indiana. The balance of our eleven man crew were mixed between non-rated seamen and firemen to include guys like Cary Shiosaki of Idaho, Mike Clinard of North Carolina, Don Hayworth who later became our Gunner of Oklahoma and who subsequently transferred to Dong Tam down South, and Larry Dean of Texas. Yes, there were others in that crew who came and went during that year including Larry Odom a Quartermaster from Oklahoma and another Gunner by the name of Pat Garrison of Arkansas but although I can still see many of their faces, I can’t recall all of their names after almost four decades. YFU-79 on entrance to Perfume River with grenade blast off starboard bow – 1969. My time on the YFU-79 ran from summer of ’69 to the summer of ’70 at which time the Navy transferred the YFU-79 and several other U-boats to the Army’s 329th Heavy Boat Company as the Army picked up I-Corps logistics support from the Navy and we also began the Vietnamization process by transferring craft to both the South Vietnamese and to the Cambodian Navy. 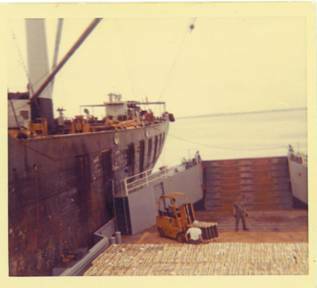 In fact, the last several ammo supply runs that I made on the YFU-79 in May and June of ‘70 was with an Army Warrant Officer as the Craft Master with a half Army and half Navy crew as we trained the Army guys on Skilak operations. Running the boat as a Navy guy under an Army warrant was definitely different. Now as a kid fresh in from the States, after landing in DaNang which was an interesting experience in itself with mountains on three sides and the pilot wanting to avoid potential enemy fire, and going through in-processing at NSA DaNang, I was assigned to the Lighterage Division, commanded by LT. Terry McCloskey, and then I was on to the YFU-79 after being in-country all of two days. Being non-rated at the time, I got to bunk with five other guys in a compartment right off the main deck. This was tight quarters even by Navy standards (my subsequent assignment to a WW-II era ATF after I rotated out of Nam was spacious by comparison). However, we were all Can-Do types of guys and they made room for the new guy and we went to work. I barely got my duffel unpacked and my gear stowed and we had a new cargo assignment that same day. So we pushed off from the Sand Ramp at Tien Sha in DaNang Harbor and proceeded to the anchorage area of the harbor where we pulled alongside an ammo ship. It was a Korean flagged vessel with Taiwanese and Korean crew. We took on about 250 tons of ammo from this break-bulk freighter and cast off and headed out of the harbor just at sunset. It had been a busy and deceptively beautiful day in the harbor and except for the fighter jets that you could see coming in to land at the air base and the Marine helos heading out to points unknown towards Marble Mountain, one could have been State-side until you looked at your cargo, and yes, you were in a war. Once we cleared the harbor and were into the South China Sea, Chief Mason set the first watch. A watch section consisted of a 3rd Class rated guy plus two non-rated fellows with one normally a seaman and the other a firemen. I got assigned to our 3rd Class QM – Rich Geiser. Rich proceeded to read me in on my duties and immediately gave me the helm and a course heading. We were running south along the coast after rounding Monkey Mountain and we would hold that course most of the night where we would stay about five miles out to sea. It was a languid night with a pleasant warming breeze coming off the light seas of the South China Sea. Again, I had to pinch myself to remember where I was and a look toward the shore would occasionally remind me that this was a war as you could see occasional artillery fire in the distant hills along the coast. My first watch on the 79 ended at midnight as some light fog began to form and I went down to my bunk where I promptly sacked out. Later that night about 03:00, I had a tap on the shoulder by one of my crewmates who told me that the Chief wanted me topside pronto. I popped up and noticed that the fog had gotten a lot thicker from when I had gotten off watch. Looking at the radar scope I could see that we were still running a few miles off the beach but there were now some islands off to the East that were showing and also a contact. The Chief had the port signal light up and told me to signal the contact who at this time had popped two flares which seemed other worldly in the fog conditions. I got on the light as our boat’s radioman and flashed out that we were the YFU-79. They came back with an acknowledgement and immediately veered off from our port side heading north into the night’s fog. The Chief told me that we had just met one of the close-in Market Time patrols who routinely patrolled the coasts interdicting NVA/VC supply junks and that it was good that I knew my code. Returning to my bunk, I sacked out until 06:00 when we were up for breakfast and the day’s work. After the morning chow, I checked to see where we were and we had just about arrived off-shore from our destination which was affectionately known as Gilligan’s Island and officially called Sa Huynh. It was on the Batangan Peninsula and supported the Army’s Americal Division among other Army units near Duc Pho and Quag Ngai. Going into Sa Huynh we were at General Quarters keeping a sharp eye out for potential mines as well as watching the surface water for any signs that the channel may have shifted since the boat’s last visit. 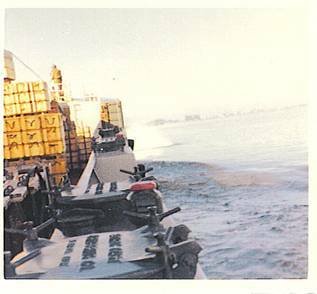 Once we crossed the sandbar to the lagoon area, the Chief headed us to the ramp where we beached and dropped our boat’s ramp and almost immediately the forklifts from the Navy detachment at Sa Huynh began to offload the ammo. 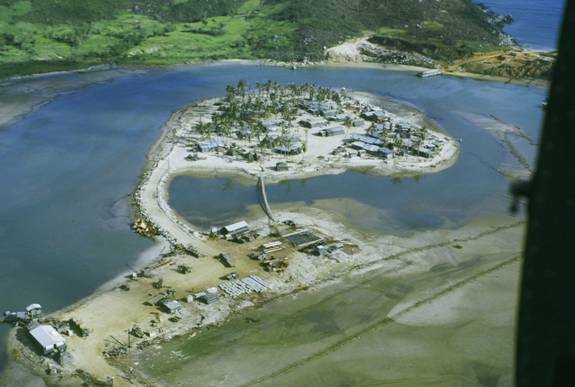 Sa Huynh aerial of boat ramp and main base – 1969. As soon as we completed off-loading, the Chief said that we should get ready for taking on some Army troopers, so we hosed off the deck and stowed our cargo rigging. We then took on a couple of jeeps one of which was outfitted with a recoilless 105mm and a platoon of combat troops with full packs. Leaving Sa Huynh, we headed out across the sandbar at the entrance to the lagoon and into the South China Sea where we again headed south. Still at GQ, we went around the peninsula and headed in to a beach area on the SE side of the peninsula where some Army troops had already setup a combat perimeter along with their TOC. Once we had beached and dropped our ramp, the contingent of troops along with their jeeps departed and joined the unit already ashore. Raising our ramp, we backed off the beach and this time we had no backhaul to take north to DaNang which was rare to ride empty. Yes, it was a fast trip riding with no cargo and we made the harbor and the Sand Ramp at Tien Sha about 21:00. So much for my first trip as a U-boat sailor on the 79 and I hadn’t been in-country a full week. There were a lot of other trips and stories that I could write about and someday perhaps I will as time and life permits. In closing, I would like to remember those U-boat sailors and boats who did not survive the war. Boats and crew were lost before I arrived in-country and continued after I left in ’70 when we had turned them over to the US Army and our Allied Naval forces with the South Vietnamese and the Cambodians. It was a tough environment and the men who manned those boats were a tough breed who I am proud to call my brothers. YFU-78 by DaNang Bridge Ramp after attack. Note: Of the eleven boats built as Skilaks under the YFU-71 Class, one of them, the YFU-78, was completely destroyed in a rocket attack at the DaNang Bridge Ramp in 1969 with the tragic loss of most crew after taking on a cargo of ammo. Of the remaining ten Skilaks, three of them still exist and serve in various capacities. The YFU-73 was transferred in ‘70 to the Cambodian Navy and still operates in those waters today. The YFU-81 was transferred to the Army’s 329th Heavy Boat Co. in ’70 and evacuated to Guam in ’75. 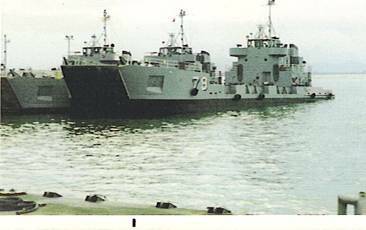 Subsequently, in the ‘80s the Navy reacquired it and operated it as YFU-81 in Roosevelt Roads until it was moved to Mayport in ‘03 and then transferred in ‘04 to the government of Panama. Interestingly, the YFU-79 after also being transferred to the Army’s 329th Heavy Boat Co. in ‘70 and evacuated from Vietnam in ‘75 to Guam, was reacquired by the Navy in the mid-80s and went through a significant reconfiguration to become the IX-514 and is today the smallest “aircraft” carrier in the fleet where it serves as an at-sea training platform for helicopters and operates from NAS Pensacola. In fact the saga of the YFU-79 aka IX-514 is an interesting one and I’d like to co-author a future article for MRFA with another enlisted guy who crewed the 514, so stay tuned for that one. YFU-78 blown bow on DaNang Bridge Ramp after attack.